I must confess, I’m eating grapes. Delicious non-local grapes. For about a month now, they’ve been taunting me at the grocery store – only $1.99 a pound. Despite the earthquake in Chile and despite the fact that these grapes had to travel around 5000 miles to get to me, they were cheaper than the local apples at the farmers market. It makes no sense. And for almost a month now, I’ve resisted because, well they came from Chile. Chile is not local. But here’s a question, do grapes, and bananas for that matter, travel here by plane or boat? If they come via boat, maybe they are not so bad. I need to do some research. Depriving myself of these bites of deliciousness for a month has certainly made me appreciate them even more. I have another confession to make. Last Friday night I bought Dunkin’ Donuts. We were on our way upstate and on a whim, I bought a bunch of munchkins for my munchkins to munch in the back seat. They were terrible. I’ve been on a Dunkin’ Donuts ban since I learned they use palm oil made by a company that is destroying tropical rainforests and destroying the natural habitat of Orangutans, Sumatran tigers, and sun bears. I stopped eating Dunkin’ Donuts the first time on principle. But after Friday night’s munchkin madness, we won’t be tempted again. They tasted greasy and totally unsatisfying. The whole experience was weird and a little upsetting. I used to love those bites of fast food naughtiness. And the hungry. . .
It’s day two of eating raw. Twice a year I do a juice fast and to get prepared I eat raw. Eating raw and eating local are not super compatible. It’s not impossible to eat local and do the juice fast – last Fall, I managed. But it was October and the apples and carrots were plentiful. This time, I’m not so sure. I just looked it up, and you can juice parsnips – so at least I have breakfast for tomorrow morning. They say that juice fasts detoxify. I sort of believe it. But for me, what’s more important is that they help me put eating into context. They help me eat consciously, and help me think not just about where my food comes from (which is important to the world) but what every bite means and how much is enough. Right now I’m hungry. And over the next few days I’m going to be even hungrier. And in this case, hungry is actually good not a bad. Bananas are another non-local food I shouldn’t buy but do. The kids love them. According to this kids site, http://www.funtrivia.com/en/subtopics/Go-B-A-N-A-N-A-S-193859.html the inside of the banana peel is actually a great leather shoe polish. I’ll have to try it. Tuesday night I posted about making Muesli. The next morning, my musings on Muesli felt so very trite when I heard on the BBC news that nuclear waste had contaminated the water supply in Tokyo. According to the BBC, “Radioactive iodine levels in some areas were twice the recommended safe level.” They’re warning that the water is not safe for kids to drink. This particular piece of the disaster in Japan strikes at a very old fear for me. My parents were “no nukes” since the 70s . At least that’s as long as I can remember them being publicly vocal about their opposition to Indian Point – our own neighborhood Nuclear reactor on our own local geologic fault. As a child I was at first terrorized by the thought of impending nuclear winter and then desensitized. I remember thinking recently people have been making a fuss and worrying about Indian Point since I was a toddler. There’s nothing to worry about. Not true. For me, in addition to being horrified and terrified that my worst nightmare is happening to the entire country of Japan, it also made me less upset that I paid $24 dollars for two bags of greens and tub of organic, grass-fed yogurt on Saturday. That food may have cost me more money but it cost the planet less energy. Eating home-made muesli or locally sourced canned tomatoes or sticker shock farmer’s market greens won’t prevent more nuclear disasters. But if we can change how we consume energy — and how much — we can start to change our driving need for energy sources. We are taught to want. We are told every day to want whatever we want whenever we want it. We are taught that we are entitled to a good life of plenty. We drive to the farmers market. We turn the lights on during the day. We don’t shut down our computers. We buy bananas from Ecuador. I’m picking on things I actually still do to make my point, which is simple. We don’t need to figure out how to make safer nuclear reactors, we need to consume less energy. What I am trying to do comes down to a daily self evaluation – to make a conscious choice to be mindful of what I buy, what I do, how I behave. To think about the impact my life has on the world. make changes to my life to minimize that impact more and more every day. I want to use less energy to live a healthier lifestyle. I want it for myself. I want it for my kids. And I want it for the planet. New York is the Tokyo of North America. That nuclear waste may not have hit our reservoirs yet, but for me at least, it’s hitting home. Protest Indian Point and Nuclear Energy in general. If it’s not safe, it’s not an option.Learn more from the Hudson River Sloop Clearwater Indian Point Campaign . Or read the Clearwater’s call for Indian Point to be closed and decommissioned – not relicensed. What else can we do to move away from our fuel hungry habits and live less-impactful lives? I’m looking for little things, the “pennies in our pocket” of our environmental waste. Share your thoughts with me here. You could say, I’m a little granola shy.For almost two weeks I’ve been crunching burnt granola, which like a cook-out marshmallow that’s burst into flames and then been blown cool, has its own charm. But despite Mark Bittman’s “it’s not a big deal” tone and all the great recipes that came in from comments, granola seems like it takes more brain space than I currently have. 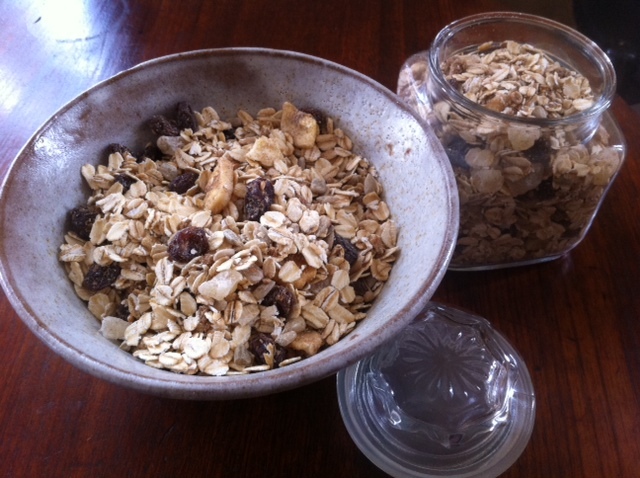 But on the granola recipe was another Bittman tip – Swiss-style muesli is just uncooked oatmeal. What?!! I had a babysitter from Poland who used to eat uncooked oatmeal. I always thought it was a bit strange. But I tried it once, and it was pretty good. I never put two and two together and figured out that what I was making was simply plain Muesli. Duh. Muesli, is truly a quick option. All you need is some oatmeal, which I always have in abundance. Here is my version of Mark Bittman’s recipe. It’s a bit slap dash, which makes me thinks, this basic formula is fool proof. I threw together what I had on hand. I thought about throwing in Almonds, but honestly the sunflowers gave it enough of nutty flavor that it wasn’t necessary. And from a calorie perspective, I erred on the side of less fattening nuts to balance out the super fattening little shots of sugar, dried pineapple. I made this batch in five minutes. Literally. Then I mixed a half a cup with some Hawthorne Valley plain yogurt and it turned into a delicious creamy treat. I mean breakfast. Of course the question of the day is, will the kids eat it? My guess — B will love it. Not so sure about incredibly picky Z. Still, I have my fingers crossed. If it works, I could leave the boxes of breakfast cereal in the cereal aisle. Toss together all the ingredients until the brown sugar and cinnamon has been distributed evenly. Store in a jar. I am storing mine in the refrigerator since it has flax seeds. A salsify by any name . . .
By the time I got to the farmer’s market Saturday, it was late and the eggs were all gone. Still the air was warm, the sun was shining and, for the first time in months, I could buy things to eat that didn’t come from a root cellar. The farmer promised me that the gnarly parsley in the big bin was new. So was the salsify in the bin right next to the parsnips. Salsify. It sounds like a verb. Maybe an evangelical verb. “Brothers and sisters, are you ready to Salsify? But it’s not. It’s another one of those weird vegetables that people used to eat back when we were hungry and didn’t have options. Now it’s a novelty at the green market. But since, there is very little local that’s in season, I picked up a few on Saturday. Goatsbeard, the other name for salsify, brings up a whole other set of connotations. “Where’s the goatsbeard? Oh, it’s over there next to the eye of newt.” However, despite its fantastical Dungeon’s and Dragons name, the root doesn’t seem to have any magical properties. The third name for salsify, is oyster vegetable because cooked, it’s supposed to taste like oysters. That also sounded intriguing. I have found a recipe for oyster stew with salsify, but since John is a vegetarian and since I really wanted to see what the thing tasted like I went simple. I boiled it (using a 1919 recipe off a site called Vintage Recipes) and added a bit of salt and butter. It was okay. It did taste a little like oysters and it had a earthy flavor reminiscent of celery root for me, but not nearly as overwhelming. I could see how it would be a nice alternative to mashed potatoes, or as a subtle hint in a soup paired with the right beans. I was curious what I was getting nutritionally. Was it less calories than a potato? Was it a resource for any special vitamin? Ironically, it’s really not. 75 g of potato is 58 calories. And 133 grams of salsify is 109. According to my math, gram for gram, the two are roughly the same. So why salsify your menu? Potatoes are cheaper and more plentiful. I guess, the big draw is seasonality. I have not given up prepackaged frozen vegetables. I still see them as an option. But seriously, as the price of gas continues to rise learning to eat local is going to look less and less like a choice. I guess this is the week of super expensive — I mean sustainable — pasta. It started with my $10/lb pasta I bought at The Brooklyn Flea. And I promise I’ll blog about this in more detail when I’m not so zonked. But the part of the story that’s important to what happened tonigh. 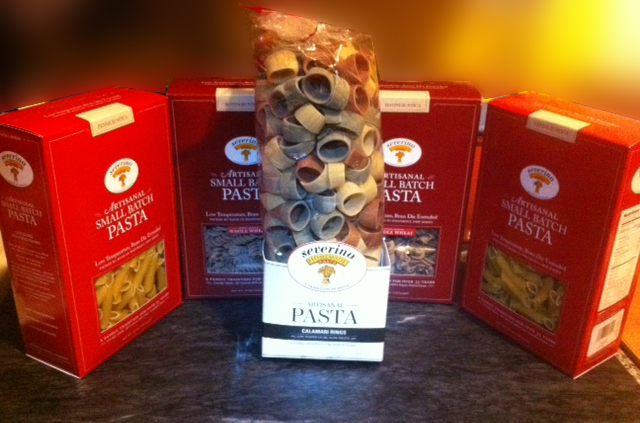 Because I spent $10/lb on pasta on Sunday, I was able to spend $6/lb on the local pasta I’ve been eying at Whole Foods. It helped that the brand, Severeno, was on sale. So I bought several boxes and a bag. The boxes were 2 for $5 — not outrageous. The bag, which with it’s little red bow at the top looked like the kind of pasta you get in a gift basket, was $6. I’ve seen this brand before and John and I have always joked at the irony of pasta from NJ costing 3 times the price of pasta from Italy. But since it was on sale, and since it was cheaper than what I had bought on Sunday, I indulged. It wasn’t until I was on the subway coming home that I started to wonder what exactly I was buying. I mean, what exactly does artisanal pasta mean. In my imagination, I saw some beautiful Italian guy rolling out layers of dough with such forceful intensity that beads of sweat start to bead down his muscular forearms — — maybe there’s even Puccini playing in the background. If you’re curious what Artisinal really means in this case, check out this YouTube video. It looks to me like in this case, Artisinal means small factory manufactured. No hot guy. No rolling pin. But what do I know. Maybe this is how they do it in Italy. The website claims the machinery comes from Italy. Meanwhile, when I got home I realized, I had just paid more money for pasta that wasn’t even organic. And I’m not sure if this should matter to me. Almost a year into this investigation of what I should feed my family and Ii still am undecided — is it better to eat organic from Naples or conventional from Newark? What’s healthier for my kids? What’s less problematic for the planet? The internet to the rescue, right. But in this case, there isn’t a clear answer. I just did a Google search “Are there pesticides in my pasta?” no results. I’ll have to do a bit more investigating tomorrow. And on Thursday night, the kids will do a taste test. But right now, my gut is telling me I was probably seduced into buying pricey pasta that may not be worth it, by my standards of health, sustainability and overall global impact. As I continue this investigation, I think I see a pasta machine in my future. But even if I change my pasta habit to homemade, I am sure I will still need to buy a pack now and again. So, this is clearly a basic, I need to untangle and determine a point of view on. My results of my little taste test are in and Jersey Fresh Crushed and Scalfani Tomatoes are both winners. I haven’t had a chance to call Violet Packing to see if someone will tell me if Scalfani tomatoes are the same type and batch as Jersey Fresh Crushed Tomatoes. But last night I did my own taste test. I’ll let you know what my palate says, then once I get through to a source, maybe we’ll see if I am right. You can’t tell from the photo, but the Jersey Fresh Tomatoes are a bit thicker. They have a slightly more intense field tomato taste. 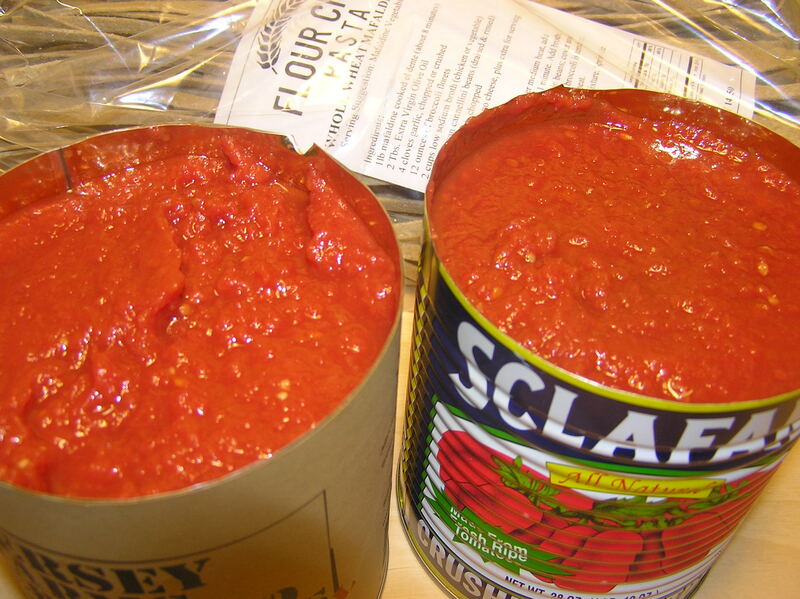 If I had to guess, and I am, the Scalfani taste a bit more like romas and straight from the can are a tiny bit more watery. Both are local (Jersey grown.) Both are minimally processed (water and salt). And both claim they are packed within 24 hours. Are they the same. I’m guessing, but I don’t think so. And honestly, they are both pretty darn good. Last week, I made (and fell in love with) the Bklyn Larder recipe for spicy tomato soup and, it may have been a can, but this is not the Campbell’s Condensed my mom used to force on me. I never loved it, but only would tolerate it because I did love the iconic side of a grilled cheese sandwich. This soup was totally different. It’s vibrant and fresh. The recipe is ridiculously easy – tomatoes, butter and sugar and hot sauce which apparently is very close to the recipe for buffalo chicken wing sauce. For me, it really worked. And I was surprised that blending butter into the tomato gave the soup a pale color – reminiscent of my moms can of milk in the tomato soup but sooo much better. The Jersey Fresh package came with a recipe for easy marinara sauce from Primizzi which they claimed would rival the best jar. Last week, I made it, being careful to follow the recipe exactly, and they were right. It was really quick and really good. 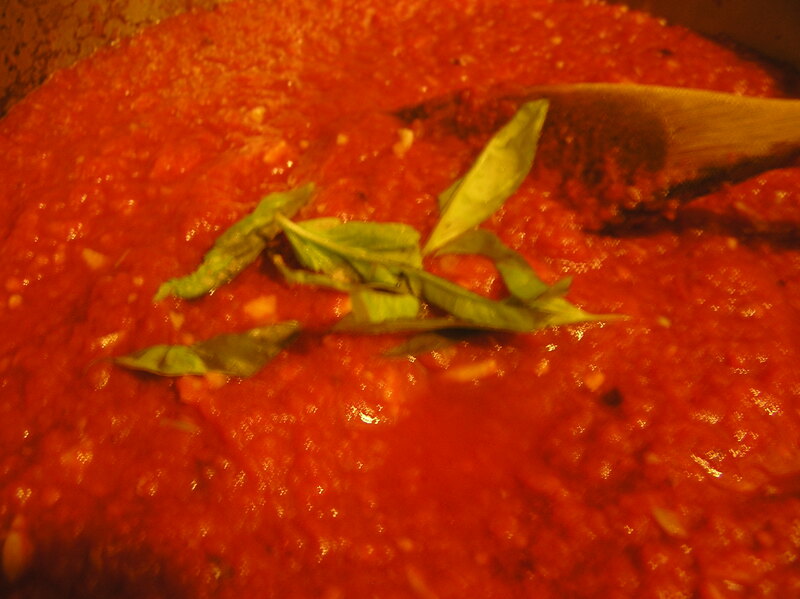 I’ve certainly made sauce from scratch before, but I’ve never pared it down to just garlic, tomatoes and basil. Usually I add onions at least. But in this case, simple was superb. Tonight I made the same recipe with the Scalfani tomatoes and I have to admit there was no significant difference from the Jersey Fresh. Both cans made restaurant quality tasting sauce. Last night we ate this sauce on Flour City Pasta. Super yummy. Super local. And super expensive. I’ll tell you more about that in my next post. In the meantime, here are two canned tomato recipes that could make any Meatless Monday deliciously easy. 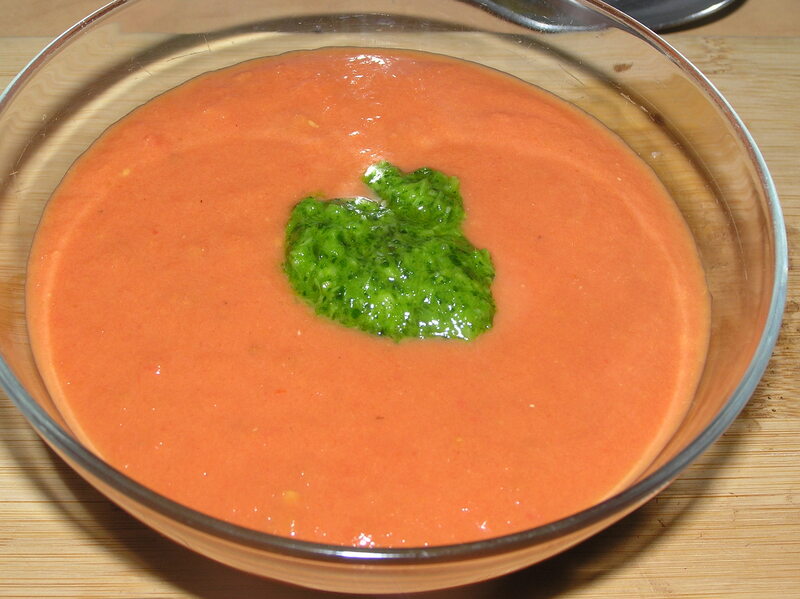 I served the soup with this cilantro pesto. It was delicious. Enough olive oil to make a thin paste. Blend all ingredients in a blender, mini food processor or mortar and pestle. Dribble on soup before serving. Dice garlic. I added a bit of salt and used the back of a knife to make a paste. Sauté garlic in olive oil just enough to get it soft. Don’t brown. Add the tomatoes. Cook for five minutes stirring. Add red pepper flakes and half the basil. Salt and pepper to taste. 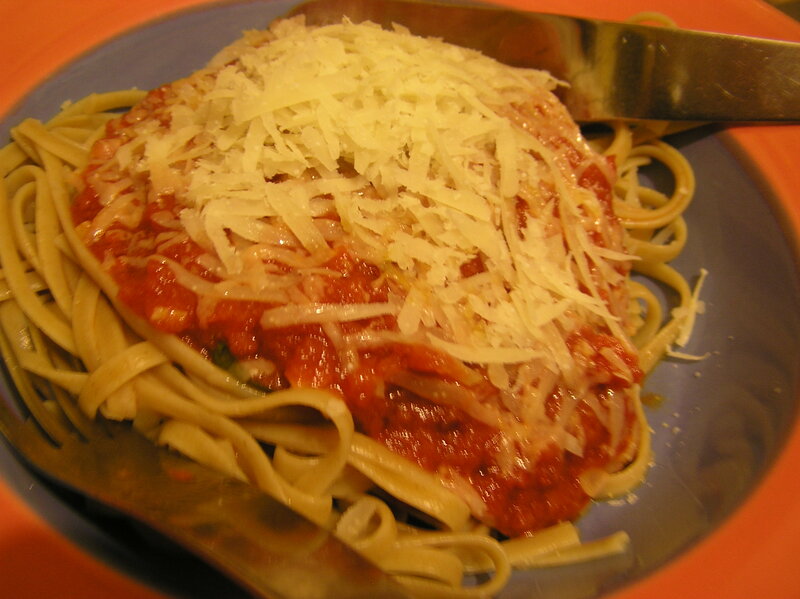 Serve with pasta. Add the remaining basil for garnish. Note: You can buy Jersey Fresh Tomatoes Primizie. And I believe the Caliban’s Kitchen Discount is till valid. Use coupon code: CKITCHEN25 and you’ll receive $25 of $50 purchase. Attempt number two at Mark Bittman’s recipe for easy granola failed. Well, it didn’t exactly fail. But it’s definitely crispy around the edges. Don’t be fooled by the picture — the burnt bits look a lot like raisins. But in this case, looks are deceiving. It’s not going to pass the kid test. Which was the point — I need to find a way to lose revise their go-to breakfast of boxed cereal. Organic Fruit Loops or Cheerios. Lots of packaging and who am I kidding. It’s just processed food. I did eat this granola however — this morning for breakfast. My mouth is watering thinking about it. 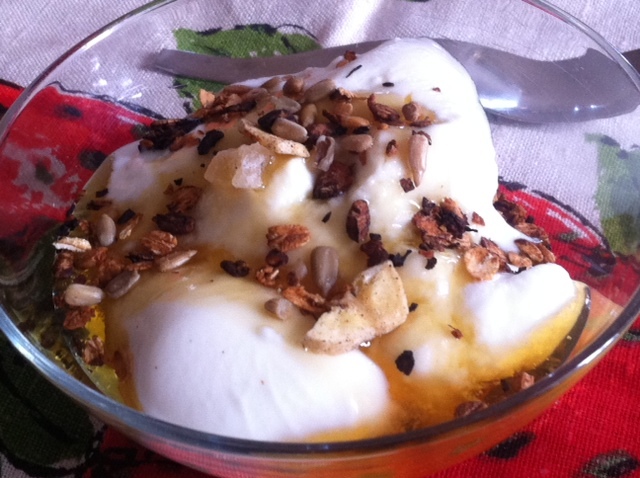 A little plain Yogurt and a dab of honey. Yum. Still if anyone has a foolproof method for making granola — especially one that allows the oatmeal to stick together in little delicious chunks — send it along. In the granola, I used the honey we bought at the farmer’s market on Saturday. We are not a honey only family — we still use refined sugar — but we do use a lot of honey. I bought a gallon jar for $38. If you think about how much one of those plastic honey bears costs in the grocery store, this is a bargain. Good honey really tastes better. And the honey man said that it would keep for while. We were worried about the honey crystallizing but he assured us that as long as we kept it room temperature that wouldn’t happen. Another perk is that some believe eating local honey every day can help with seasonal allergies. Here’s a paragraph from Discovery Health that explains it all in more detail. Of course, everyone who tried (like me!) knows that bag wasn’t compostable the first time — I’m not going to fall for that again. Sorry kids. Still trying to call Primizie back to see if I can get some clarity on those canned tomatoes. But yesterday work was a bear — pretty much back to back meetings all day. I ran out of the house early, forgot my lunch and ended up having to hit Pret it for all my meals. Normally, I rinse out paper soup cup and plastic spoons, but I have to confess, I was so tired I threw it all out. I guess, you could say I had a garbage slip. I’m only reporting it because I don’t want to get complacent and start giving in to the ease of the disposable. Reuse and recycle aren’t always easy. But I want to be the person who makes the right choice — even if that makes me the weirdo garbage-hoarder eating burnt granola on Madison Avenue.